You’d be excused for thinking it’s easy to get away with lying to Congress: So many people do it these days. Alas, every now and then, our words catch up to us. That’s what happened to Commerce Secretary Wilbur Ross this week. See, Ross and the Commerce Department are currently tangled up in embarrassing litigation over Ross’s insistence that the 2020 census ask respondents about their citizenship status, a move pushed by voter suppression guru Kris Kobach and “economic nationalist” Steve Bannon. Ross told Congress in March that the idea for a citizenship question on the census — which will almost certainly lower the government’s population count in immigrant-dense (read: Democratic-leaning) areas — was the result of a Department of Justice request. He said he was “not aware” of any White House involvement with the issue. Ross claimed the DOJ asked for a citizenship question because it wanted better data to enforce the Voting Rights Act; we all know how keen the Trump administration is to protect voting rights! Now, Ross — after months of court filings showing as much — has finally conceded that he was in touch with the White House after all, months before the DOJ got involved. Case closed, right? Not so fast: The Department of Commerce claims this isn’t evidence Ross was lying to Congress. When Ross told the House Appropriations Committee that he was not “aware” of any communications with the White House about a census citizenship question, the department said Friday, he was under the impression that he was responding to a question specifically about a campaign fundraising email in which the White House sought to raise money over the citizenship question. Ross, a Commerce spokesperson claimed, was telling Congress he didn’t talk to White House officials about that email. The census lawsuit, meanwhile, rages on, though there is little mystery as to why Trumpers want a citizenship question. So the lawsuit continues. 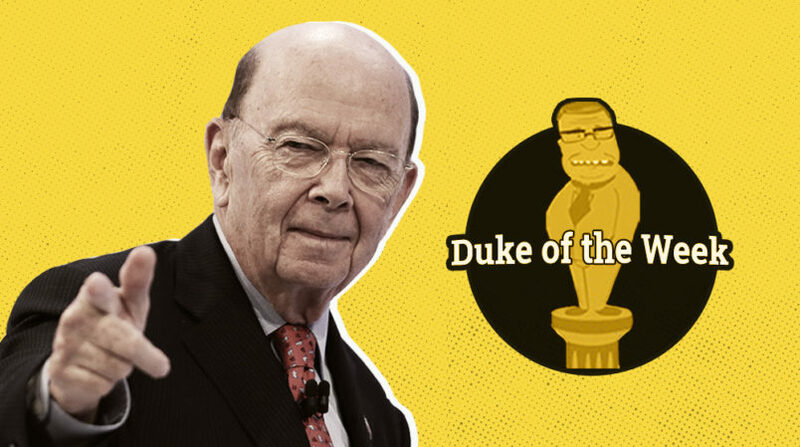 And Ross, for his attempts to hide a cynical effort to undercount immigrant communities, is our Duke of the Week.